"I wish she was still here ... but I do find comfort in knowing that she helped stop a serial killer in his tracks," the victim's father said. A Texas jury found a man accused of killing a University of Texas at Austin student in 2016 guilty of capital murder on Friday. 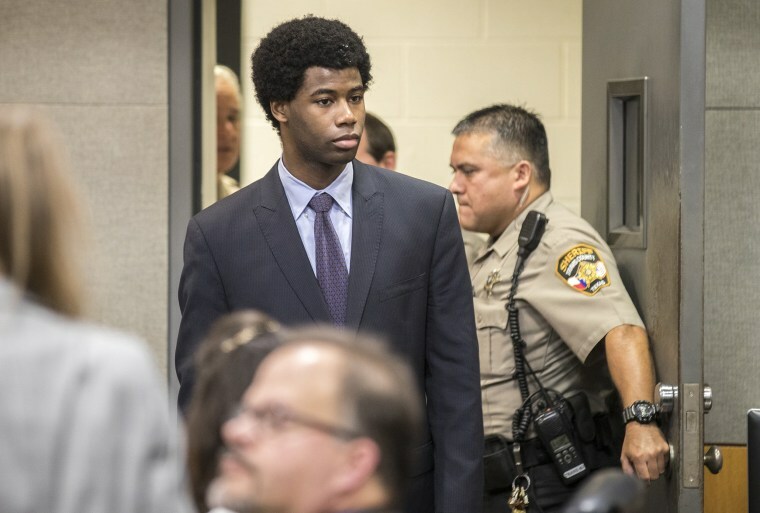 Meechaiel Criner, 20, was found guilty in the killing of student dancer Haruka Weiser, an 18-year-old freshman at the Texas state school. Weiser's body was found in a creek on the school's campus in April of that year. The jury of seven women and five men discussed the case for more than 10 hours before they came to their verdict, according to NBC affiliate KXAN of Austin. Their decision left state District Judge David Wahlberg to sentence Criner to life in prison. Criner is not eligible for the death penalty as he was 17 at the time of the murder, but he is eligible for parole in 40 years. At the time of the killing, Criner was homeless in Austin after leaving his grandmother's home in a Texas city more than 300 miles away. After the verdict Weiser's father, Thomas Weiser, took the stand to provide a victim impact statement, KXAN reported. "Haruka did not choose to sacrifice herself. You made that choice for her. But she did not die in vain. We will never know how many lives she saved through the events of her death," Weiser said, according to KXAN. "I wish she was still here where I could see her, but I do find comfort in knowing that she helped stop a serial killer in his tracks," Weiser added. Criner said he left his grandmother's home in Texarkana, along the Texas-Arkansas border, at 17 because her religious beliefs demanded that teenagers his age "make their own way in the world," according to the Associated Press. He then hitchhiked and walked the more than 300 miles from her home to Austin. According to Criner's arrest affidavit, Weiser's friend last heard from her when Weiser called to say that she was "on the way" after her class completed at 9:30 p.m. in early April 2016. Weiser was then reported missing the following day when she missed her 11 a.m. class. Upon the review of the school's surveillance video, the affidavit said, police found a video that appeared to show Criner watch Weiser as she walked past on the school's campus — minutes after the phone call — and then pulled out "a shiny rigid object." Two days after Weiser's body was discovered in the creek, police found Criner inside an abandoned building burning items, according to the arrest affidavit. He had in his possession items that belonged to Weiser and also attempted to burn some of them, the affidavit said. Once investigators confirmed the items did indeed belong to Weiser, they arrested Criner at a nearby shelter, police said in the affidavit. Criner denied killing Weiser as recently as Thursday, the Associated Press reported, claiming that the night the dance student was killed he'd been at a hospital charging his cellphone and tablet. UT Austin President Gregory L. Fenves said in a statement Friday that "A verdict provides some closure, but it doesn't heal the pain or ease the sense of loss felt by Haruka’s family and all of the students, faculty members and staff members to whom she meant so much. We still hurt terribly. We still feel her loss on a profound level." The killing prompted a security review on campus, and among the recommendations made were improved lighting and a larger campus police force, KXAN reported. There are other security upgrades in progress, the station reported.